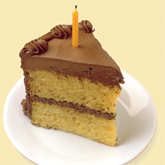 Livliga® Live Vibrant Blog: You Ate A Slice Of Birthday Cake--Now What?!? You Ate A Slice Of Birthday Cake--Now What?!? I came across a listing of foods we sometimes treat ourselves to. I like how the facts were broken down, including the various ways we could burn off what we just ate. Allows us to take responsibility and avoid the guilt. I hate looking at Birthday Cake on my thighs....now I can avoid it! you will be a great author.I will be sure to bookmark your blog and definitely will come back in the foreseeable future. Thanks so much for your feedback! It is nice to know who is actually reading my blog out there. Also appreciate the encouragement! Live Vibrant! You Ate A Chocolate Filled Croissant--Now What? Why Livliga works- positive "cues"
What is so Cool about the Mediterranean Diet?